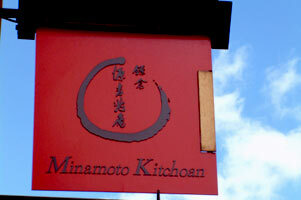 Wandering around London I have come across several places with some Japanese interest. 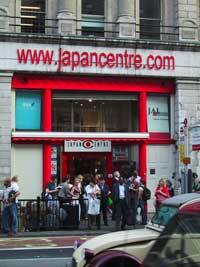 The Japan Centre is a modest shop in London Piccadilly with a food store in the basement, a cafe and travel agency on the ground floor and a bookstore upstairs. The bookstore carries most language texts such as Japanese for Busy People and also has a small selection of imported DVDs, including most of the Ghibli collection for rent. A Japanese confectioners. Very authentic looking with shop assistants with frilly bows. You might even be able to practice some Japanese on them. The decor is very precise. And you can also have a tea or coffee with your sweets in the shop itself. You can have your sweets wrapped beautifully and the individual wrappers are novel to a western eye. The sweets themselves aren’t very sweet. They are more cakelike or gelatinous at least in the selection I was given. (I must say my tastes run more to the Belgian House of Choclate next door. But most of the shops along Piccadilly look so expensive and uninviting to my T shirt, jeans and boots ensemble that I wouldn’t venture in). Pens, paper, paints, brushes, craft supplies. But amongst all this graphics paraphanalia are fountain brushes. Made by Pentel, these work like a fountain pen but have a brush instead of a nib. You can’t put the blackest of inks in them as shellac based ink will gum up the workings, but its much more convient than grinding ink on an inkstone. Shodo purists wouldn’t be happy but these are great for everyday use. The brush comes in three sizes 小 small 中 medium and 大 large. And they cost ￡4 each. 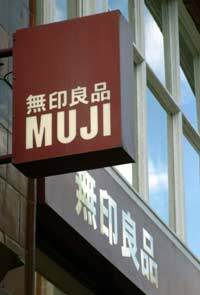 This shop has several inexpensive books of royalty free Japanese design for sale. Brighten up your life with Japanese motifs. They also have books about origami and a small selection of origami paper. 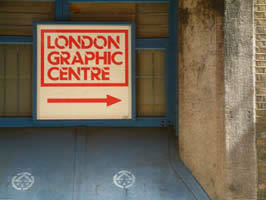 Its branch on Tottenham Court Road has a large selection of papers on its top floor. There are washi papers and other handmade Japanese papers. Beautiful and inexpensive for craft work, art work and giftwrapping. They also have origami paper and chiyogami prints. 6-17 Tottenham Court Road, London. For all your minimalist needs in plastic and brushed aluminium. I especially like their stationary ranges. And for the student of calligraphy they have a disposable brush pen. Brushes take a bit of practice to write with. A light touch is best apparently. They can give a more fluid and rounded line than a pen. You can also play the “my!-isn’t-it-cheap-in-Japan” game. The labels on a lot of the goods are in Japanese (might help your reading) and have the Japanese price on them. So the ￡3 plastic box only costs 126円 (65p) in Japan despite Tokyo’s cost of living being higher than London’s. Go figure. The Japan site is here. Tiny shop full of tiny things. 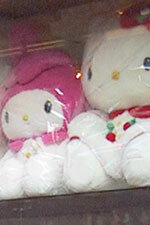 Hello Kitty, Sailor Moon, Astroboy, Totoro, Gundamn Wing collectables. Mainly little things to put on your mobile phone, although there are some stuffed toys, stationary and models. Kitsch or Cute depending on how you feel about these things. 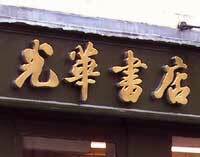 …there is an unassuming Chinese bookstore. But in the basement there is a wealth of cheap calligraphy supplies; inkstones, inksticks, ready mixed ink, paper, brushstands and brushes. You can also buy the Chinese version of the hanko, a chop. Or you can buy soapstone blocks to carve your own. The shop also stocks practice paper for children learning calligraphy. This has quite large squares with diagonal and across guidelines to help you make balanced characters. Unfortunatly the paper is of very low quality and the ink seeps into it but if you cut it out of the book it’s very useful to practice on. In the basement they have a large collection of Anime DVDs and Manga in English translation. There are a couple of Japanese language manga, mainly Ghibli picture books and it seems that all the kanji have furigana so while not easy to read at least kanji won’t be a problem. There are also Japanese language books about art and animation as well as how-to-draw manga and anime books. 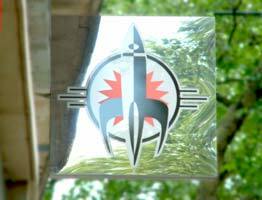 On the ground floor there are model kits, collectables and magazines. Strangest one is a Japanese magazine about dressing up as your favorite manga character (cosplay) including a pattern for a costume. 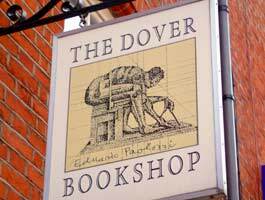 This is a tiny second hand bookshop crammed floor to ceiling with books and magazines. If you can actually read Japanese this is the place to head. Apparently it is only open at the weekend. 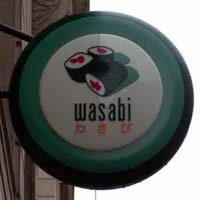 However there is also a branch in Soho. 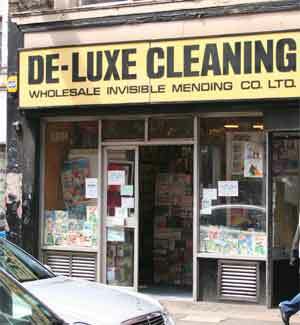 There’s no signage, in fact it still has the signs from the dry cleaners who once owned the shop. And it’s not a temporary thing as they’ve been there well over a year. This small shop is crammed with Japanese books and manga. Compared to other places you can get Japanese books in London their prices are very reasonable. 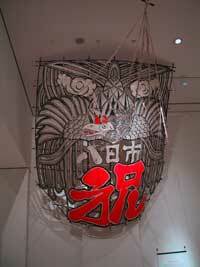 Also the museum occasionally has Japanese events. One year a festival float was built in one gallery and there was a display of enormous Japanese kites (Some at least 3m high, unfortunately my photos don’t give a sense of scale). Recently there was a talk about Karakuri by Shobei Tamaya IX in the museum’s wonderful lecture theatre underneath the Great Court. 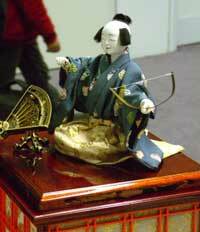 He demonstrated a ちゃはこび　にんぎょ (Chahakobi Ningyo – tea serving puppet) and the very intricate ゆみひき　どじ (Yumihiki Doji – archer doll). 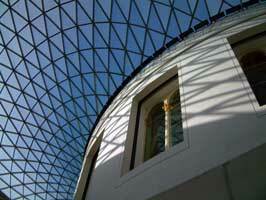 Situated near the British Museum. 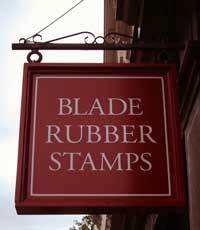 They can make you custom rubber stamps. The museum of applied arts. 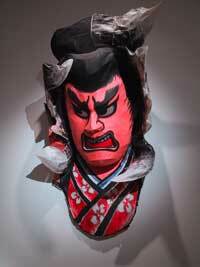 This is a huge museum and has three galleries of Japanese interest. The main gallery on the ground floor has a large collection of armour, swords and their fittings, inro and netsuke in an unfortunately very dimly lit display. There are also kimono on display here. 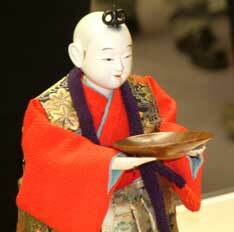 On the 6th floor there is a display of japanese ceramics with some truly beautiful items. I was in this gallery on a bank holiday Monday and was the only person there despite other parts of the museum being quite full. Maybe they couldn’t manage the stairs. The other gallery on the 4th floor, (also quite empty) has a collection of Japanese textiles including modern kimono. As part of a hands on approach there are kimono for visitors to try on here.